Seven campuses educating roughly 4,000 students across four elementary and three middle schools were placed in the first cohort of ACE campuses that launched in the 2015-2016 school year. With the recent release of 5th and 8th grade STAAR scores for 2018, the student achievement growth that these campuses have seen in just three years has been substantial. 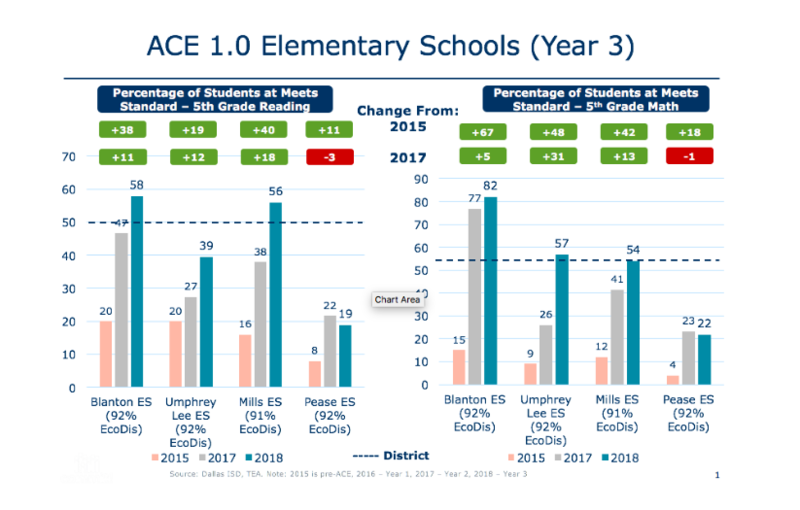 Three years ago, Dallas ISD launched their Accelerating Campus Excellence (ACE) effort as a comprehensive equity strategy to transform some of the lowest performing schools in the district and the state. All campuses had been on the State of Texas ‘Improvement Required’ list for consecutive years, placing them within the bottom 5% of schools statewide based on student achievement. The ACE effort is centered on providing a more equitable distribution of the district’s most valuable resource, as it financially incentivizes the district’s more effective teachers and principals to collectively work in its highest-need schools. The program also supports learning by providing a longer school day, after hours enrichment, and three hot meals per day to better support the whole child. Seven campuses educating roughly 4,000 students across four elementary and three middle schools were placed in the first cohort of ACE campuses that launched in the 2015-2016 school year. With the recent release of 5th and 8th grade STAAR scores for 2018, the student achievement growth that these campuses have seen in just three years has been substantial. 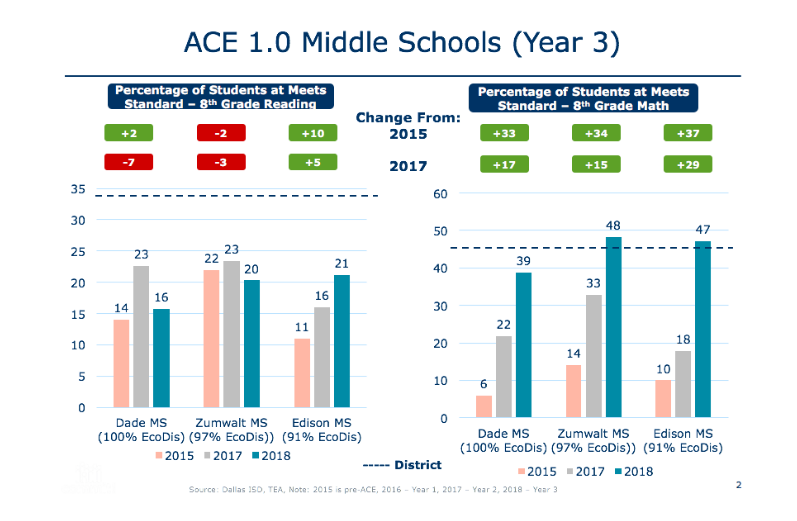 All ACE elementary school campuses have seen double digit STAAR score growth compared to pre-ACE scores of 2015, including percentage gains of 40 to 65 percentage points at select campuses that were some of the lowest performing in the state just three years ago. Middle schools have reflected 30 point gains in math achievement across all campuses, while reading scores, though improved, have seen lower increases (once again highlighting the importance of early reading proficiency as later remediation efforts can be quite difficult and expensive). 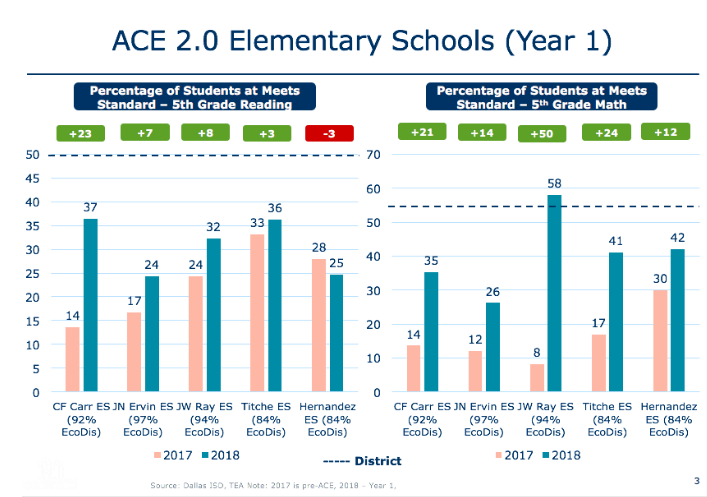 The second cohort of Dallas ISD ACE campuses were launched this school year, and already the impact of the program can be seen on student achievement. Math scores are up by double digits, including an amazing 50 percentage point gain at J.W. Ray Elementary, a campus that had been on the state’s Improvement Required list for four years. Nearly all schools showed growth in reading, including a very notable 23 percentage point gain at Carr Elementary in West Dallas. And the single Cohort 2 middle school (Thomas Rusk) reflected double digit growth in both reading and math. What we believe this shows us is that equity works, particularly when we focus on equity in educator effectiveness. Its cost of approximately $1,300 per student, while significant, appears to be showing much higher impact than other turnaround strategies. The ACE model continues to provide a district framework that ensures that not only are a district’s more effective teachers working with the students with larger needs, but that the school is seen as a safe, warm, welcoming place, where children’s social-emotional needs are met. Urban and suburban schools and school districts across the country are struggling to address various student achievement gaps based on both race and income. The ACE program continues to show real promise - not as a silver bullet, but as a comprehensive effort to care for the needs of the whole child while ensuring access to excellent instructional quality. Given the success of ACE, school districts across the State of Texas are taking notice and looking at ways they can learn from the effort and even implement ACE within their own schools. Best in Class, a coalition launched by the Communities Foundation of Texas and Commit, is providing technical support and strategic advice to many of these districts as they seek to model and replicate the success of this innovative Dallas ISD effort. If you are a school district official interested in learning more about how ACE can help you provide equity in the pursuit of narrowing or eliminating achievement gaps, please contact Dottie Smith or Betsy Cook with Best in Class.